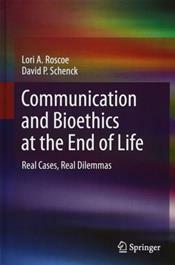 This casebook provides a set of cases that reveal the current complexity of medical decision-making, ethical reasoning, and communication at the end of life for hospitalized patients and those who care for and about them. End-of-life issues are a controversial part of medical practice and of everyday life. Working through these cases illuminates both the practical and philosophical challenges presented by the moral problems that surface in contemporary end-of-life care. Each case involved real people, with varying goals and constraints,who tried to make the best decisions possible under demanding conditions. Though there were no easy solutions, nor ones that satisfied all stakeholders, there are important lessons to be learned about the ways end-of-life care can continue to improve. This advanced casebook is a must-read for medical and nursing students, students in the allied health professions, health communication scholars, bioethicists, those studying hospital and public administration, as well as for practicing physicians and educators.